The public appetite for telemedicine is large and growing. A recent study by The Alliance for Connected Care found that 64% of consumers said they would be willing to have a video visit with their doctor. Research further proves that telemedicine is as effective and significantly less costly than in-office care. 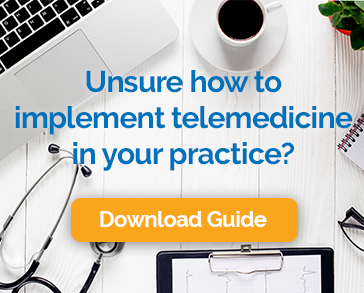 With these factors in place, you would think that practice would be jumping over themselves to implement telemedicine programs, but adoption has been slower than one might expect. One of the reasons that some practices have put off offering video visits is lack of clarity about how practices are reimbursed for telemedicine. It is, no doubt, a complex picture, but it is possible to get paid for remote encounters. Smart practices have the knowledge and tools in place to boost profits. In addition, public and private payers are beginning to appreciate the cost reduction possibilities of telemedicine and increasing the circumstances under which video visits get paid. More than 49 million Americans rely on Medicare for their health care, so it is important to understand how telemedicine reimbursement works under the program. Medicare places certain restrictions on which telehealth services are payable. Patient Setting: In most cases, Medicare will only pay for telemedicine visits when the patient is located at what’s called an “originating site.” Qualified originating sites are clinical locations such as a doctor’s office or hospital. This requirement limits the application of telemedicine for Medicare patients, but the trend is toward removing it. Congress has already waived the originating site requirement for participants in the Accountable Care Organization (ACO) program. Technology: Medicare has a fairly broad definition of the technologies that constitute telemedicine. Its definition included, “interactions between a healthcare professional and a patient via real-time audio-video technology. Geography: In addition to the originating site requirement, Medicare only covers video visits when the patient is presenting form a defined rural area that qualifies as a Professional Shortage Area or one that is outside of a defined Metropolitan Statistical Area. Like the originating site requirement, this restriction has been waived for ACOs. Provider Type: The range of providers eligible for reimbursement under Medicare is broad and includes physicians, psychologists, dietitians, nurse practitioners, social workers and others. While the restrictions on reimbursement may keep many practices from delivering care via telemedicine to Medicare patients, for now, keep in mind that enrollees in many Medicare Advantage programs may be eligible for telehealth reimbursement regardless of locations. Commercial payers recognize the advantages of telehealth and many have added it as a supplemental benefit. As you might guess, the policies and practices governing Medicaid reimbursement for video visits vary widely from state to state. However, forty-eight states and the District of Columbia have some type of coverage for telemedicine. Many go much further than Medicare in terms of expanding the use of remote clinical encounters. For example, 25 states recognize the home as a qualifying originating site, others do not make any requirements regarding the patient setting. Each state makes its own rules about the type of technology that can be considered telemedicine, but in this case, some even recognize technologies like store-and-forward that are not accepted by Medicare. Provider type is likewise variable, but only four states restrict reimbursement to physicians. Private insurers have been quite progressive when it comes to paying for telemedicine visits. They recognize the importance that telehealth will play in meeting the healthcare needs of a growing, aging, and sicker population. They also realize that telemedicine is an extremely cost-effective channel for healthcare delivery. In addition to insurers acting voluntarily to cover telemedicine, 30 states and DC have enacted laws that require commercial payers to provide coverage for video visits that is on par with in-office coverage. More are expected to do so soon. Providers should be familiar with the laws of their state and understand any rules regarding reimbursement. Given the complex landscape of provider reimbursement for telemedicine, the best bet for practices is to invest in a telehealth platform that has eligibility verification built in. When a video appointment is scheduled, the solution automatically verifies that the patient is covered for telemedicine. That way, coverage is never an issue. The best solutions even offer a guarantee that payment will be received, or they work with the payer to get you paid. The use of telemedicine will continue to expand as more patients begin to insist on providers who offer it. The good news is that reimbursement policies both on the government and private sides are becoming more telemedicine friendly and there are many opportunities to earn revenue from video visits today. Smart practices will take advantage of this trend to offer better service to patients, increase provider flexibility, and boost the bottom line.